I often wonder whose idea it was to make Fish Tacos. Fish. In a taco. That overloaded, cheese filled Tex-Mex staple. dripping with seasoned meat and shredded iceberg. At one point, someone thought to push a few pieces of fried and lightly seasoned mild fish into a flour tortilla and call it a meal. Now it’s everywhere and people just love them. Problem is, they ARE everywhere, and often not done all that well. The fish is almost always fried, which yes, makes it crunchy and appealing and all, but certainly not very healthy. This is fish. It’s good for the body when done right. I’ve tried numerous offerings of fish tacos, eagerly anticipating the. one. that makes it all worthwhile. The epicenter of fish taco-ness that will make me swoon, and want to run home to my own kitchen to replicate. Friends, it’s never happened. So I took matters into my own hands, in my own kitchen, and made them the way I wish they would always be made. There’s just nothing to this meal. 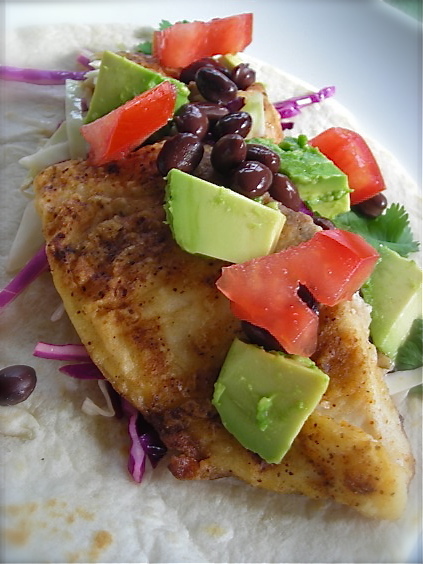 You need some perfectly ripe avocado, a plump tomato, some form of crunchy vegetable item such as gently seasoned cabbage to offset the tender fish and a simple can of black beans. Oh yes, and fish. I used tilapia but you could also use halibut or cod depending on availability. And this is fish, which we all know from experience is on the Love-Hate scale in my house. Mike loves it, and Griffin hates it. Or at least he seems to think he hates it. Because this is new to him, in the past few years, this despising fish deal. When he was quite the young boy, in his adorable, always helpful/cheerful/talkative Can I hold your hand, Mom? stage, my boy simply LOVED fish. He denies it now, for certain, but it’s true. I would make fish for dinner and he would light up in the way only small adorable boys can and exclaim “Fish! Yum!” when he pulled out his chair to eat. It was always seared in a pan, never fried, and yes I did give him a blop of tartar sauce to push his fish through, but he would eat it all without one little complaint. How I long for those days. He’s OK with it now; he’s stopped with the mega-fits when he knows it’s on the dinner menu, but will never ask for it like he does his beloved steak, and I do still keep tartar sauce on hand and allow for him to smear it on his fish as thick as he wishes. He will take the smallest piece possible to get by and eat it, almost holding his breath, only because it’s how we roll at dinnertime here. You eat what’s served or make your own. Mild, flavorful and fresh beyond belief, these tacos were such a perfect summer meal. Simple too, which these days with my schedule and valued days off, I don’t want to be chained to any time consuming menus, making the few dinners I can put together at home. The weather was gorgeous, and after Mike and I trimmed some over-zealous bushes in our yard and then impulsively chopped a few large tree branches off, dinner was still on the table about a half an hour after we came inside. 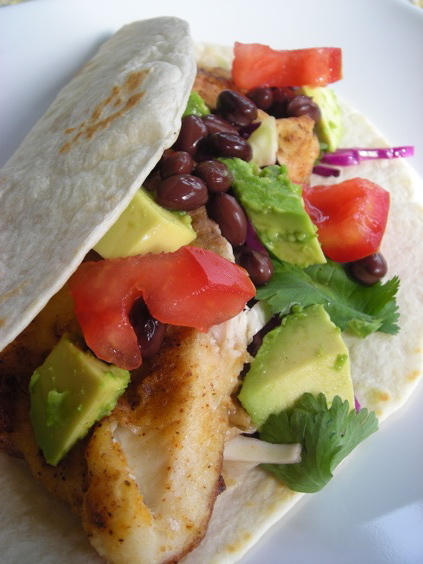 These fish tacos, with all the ease and flavor, were what I feel a good, healthy fish taco should be. For serving: flour tortillas, diced avocado, diced tomato, shredded cabbage or romaine lettuce, drained and rinsed black beans, sour cream and salsa. Heat a heavy skillet over medium high. Mix the flour and seasonings together. Adjust with salt and pepper if desired and dredge fish in mixture. When skillet is very hot, add a small amount of oil and quickly swirl to coat. Carefully place fish in pan and cook without moving for about 5 minutes. Turn over and cook other side until fish is done and flakes easily, about 5 minutes more. Cooking time is dependent on thickness of filets and will vary. Top tortillas with hot fish and toppings as desired. I adore your blog – great effort! These are exactly what fish taco should be! And they taste much better than the dreadful fried fish with gloppy white sauce abominations. Really well done. I don’t think it’s a Tex Mex thing at all though. I think Southern California and Baja. Oh man – I’m scared because you made this look easy enough….for me….to actually….try to cook them. Really been trying to find a way to get my boy to eat fish. He’s a taco fiend, so this would seem to be it! Thanks for this, I agree that the battered fish in tacos is really not the healthiest. PLUS if you get some good fish with some actual flavor, you ENJOY tasting the fish without the batter. How about improving on tilapia which is always farmed therefore questionable as far as health benefits go……..with something like wild mahi mahi, which is used, surprisingly, in the California Pizza Kitchen restaurants for some great fish tacos…I too have searched far and wide and mostly been disappointed or bored by the ones I find. But when I have the craving, I go to the CPK in Rosedale….includes housemade salsa and chips too..
Kate, I live in AZ and we LOVE fish tacos here! One thing we do differently though is the tortilla is a warm corn tortilla (actually you use two per taco-one inside the other) you also top the fish with shredded green cabbage and plenty of onion and pico de gallo which is a chunky fresh salsa. don’t forget the fresh cilantro!!! They look delicious. I love fish tacos. Homemade chipotle mayo is really great on them.